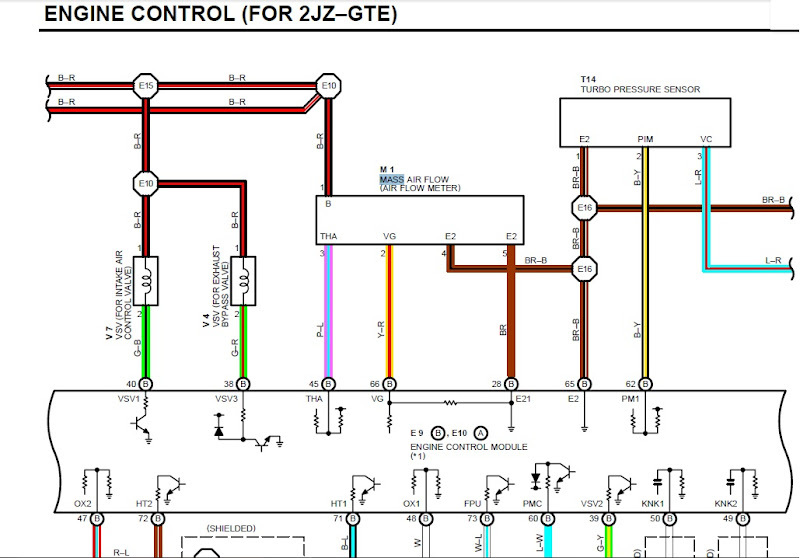 This guide is for use of factory 2JZGTE ecu's on NA-T with coil on plug conversion. I made some diagrams to help people understand whats needed for the TT ecu mod. This thread shows wiring for vvti coilpacks, which are newer generation coils found on the 1jzgte vvti, 2jzge vvti and 2jzgte vvti. The bonus is that these coils will fit under the stock 2jzge intake manifold without modification and they are excellent coils. *Edit* Just recently figured out how to do this mod without the coilpacks and keeping the stock distributor and coil. This cuts down on quite a bit of wiring and you can still upgrade to coilpacks whenever you want. See post 4 for that, I am going to leave post 1 with the coilpack version of the mod since its the complete mod. This thread has grown rather large with a lot of info spread out on different pages, so try using a google search + tt ecu mod to try and find what you are looking for. If you cannot find it or have a old/new question, just post it at the end of the thread as its just an ongoing discussion and tech help at this point, its alright even if its been asked before it can be a little challenging the first time you do the mod. So, Onto the good stuff. From here you must make a choice that will affect the parts you need to perform the mod. simple right..? not really but majority should just go ahead and use the JDM ecu which is the proven setup and works with most common na-t setups. all 2jzge and 2jzgte non-vvti have the same ecu connector so that is the starting point for this mod, we can plug in several different ecu's. For 2JZ-GE's that are 92-95, I recommend using a JDM ecu 100%. its map sensor based and takes the least amount of messing with to get it to run well. For 2JZ-GE's that are 96+ non vvti, I still recommend using the JDM ecu as its map sesnor based and runs the best out of the box. The wiring is a little different you must take power and ground from the tps as the 96+ maf (12v) is different than the 92-95 maf (5v). - IF you want to try and have an obd2 compliant ecu then there is sort of an advantage to using the USDM ecu as you can keep odb2 working. The wiring is a little different we don't reuse the maf wires for the map so see post 4 for that. *DISCLAIMER* setting up the US GTE ecu's with a maf can be quite a pain to get them to run without misfire codes. only do this if you must have emissions, and consider getting a VPC or map ecu to delete the maf. Even a vpc seems to set off misfire codes otherwise the cars seem to run ok. not sure anyones tried the map ecu yet. If you are 98+ vvti, then you have to use a JDM VVTI 2jzgte ecu but odb2 port will not work. The VVTI 2jzgte was never offered in US. The 2jzgte vvti and 2jzge vvti have the same ecu connector (I think), but its not the same as non vvti connector, so you are stuck with this ecu but the good news is you already have the right coilpacks ignitor and most of the wiring, and once done it will control vvti like a gte would, will probably need a gte maf to be swapped in place of stock maf and a map sensor added (2jz) to keep ecu happy. Don't think anyone has done this so let us know if you have more info on it. Now that we touched on the year ranges and an idea of what ecu you should look to use, I want to mention about transmissions. The tt ecu mod does not control the torque converter lockup on the GE transmissions. this function does not work. The GE trans will shift through all the gears, it just won't lock/unlock the torque converter. If this is important to you for long drives, cruising on the highway etc.. then you need to look into swapping in a TT auto and wiring it up, or swapping to a manual transmission, or possibly investing in a beefy trans cooler but I dont know if that will be enough (probably a good idea either way though). So, this write up is focused on 92-95 using the JDM ecu and VVTI coils, that is what most will end up using as it is just map sensor based. See post 4 for wiring up GM LQ9 coils (requires an IGF simulator/faker). coil on plugs: For vvti coils you need a ds62 ignitor (toyota version) (or dh61 lexus version). Heated o2 sensor works best but even the stock non-heated one works but a little longer to warm up when cold. You will also need 5 spare ecu pins to do the mod with vvti coils (recommended), 8 for doing mod with gte coils. you can get these off a spare harness or from another member or online as well as at Toyota. 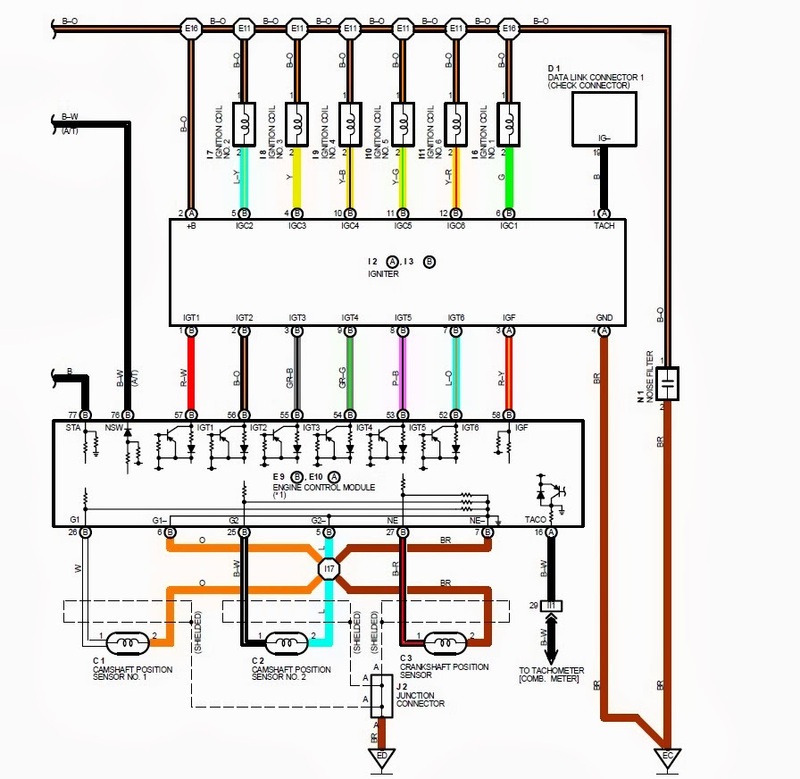 Install Stock TT MAP sensor and IAT as per diagram below, if your wire colors are different go by pin location. Map sensor can be 1jz or 2jz, thats about it. IAT can be from the 1jz, 2jz, GM, or a universal unit (im using an aem one). 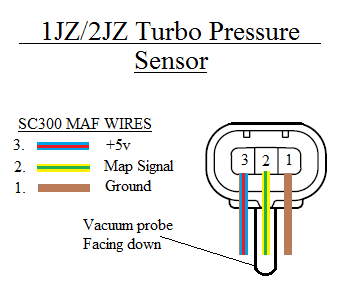 If you want to run a piggyback like the map ecu, you can use that instead of the 1jz/2jz map sensor. this is the wiring for the jdm ecu, which reuses all your old maf wires to connect your new map and IAT to. Just a heads up, when installing the map, get all your wires right and ready in the connector before plugging the map sensor in, if it isn't right unplug the map and do the wiring till you get it right. Don't make connections while the map is connected or you can hurt the map or worse the ecu 5V driver and then you could need a new ecu. stock TT size is 440cc, I suggest most people start here and it will support 400hp. good for at least a bar of boost on most medium size turbos. Without a piggyback 550's will start and drive around but will run very rich, 660cc won't run very well. Most wash out the spark in boost when running 550's and no piggyback, so a piggyback is needed for 550cc+. You are looking for top feed injectors (unlike gte side feed injectors), and you are looking for high impedance. also they are specifically import size ("Denso") or 11mm, if you see domestic or 14mm injectors those will not fit the stock fuel rail. 7mgte injectors drop in but are low impedance and require a 7m or JZ resistor pack, and usually an injector cleaning. Many aftermarket 440cc's are high impedance and do not need a resistor pack (Like some RC's, Delphi) which are the best/easiest route. Also there are alot of options online for remanufactured injectors that seem to be a good route to try. search for "2jzge injectors", I have used Oside tiger injectors and they seem to work really well as they rebuild oem injectors here in the US, watch out for other companies that do not rebuild oem ones and use Chinese injectors, they generally do not idle or run properly and are never flow matched. some retailers are getting tricky and selling Chinese injectors on ebay out of california so you think they are legit, but they are just drop shippers so check the description before ordering, be on the lookout and make sure they are actually Denso or Bosch etc... and not knockoffs. There are some injectors that have the round denso clips (like stock) like remanufactured but are easier cause they are drop in with not adapters needed. consider though that with a ffim, the adapter gives you extra length to tuck your harness under the manifold without having to break out the soldering iron. If you are 96+ or using a 96+ lower runner, note that the odb2 lower runner uses a different style of injectors that look similar to the IS300 injectors which have 2 orings, a small one on the bottom and a large one right above it. ODB1 injectors are the common ones that just have the 1 oring at the bottom. please note they are not the same generally speaking. If you have an odb2 runner it has been said online that you can get away with using obd1 injectors (although I haven't known anyone personally that has had a good experience doing it most have fuel issues), as they say the main larger oring will seal the top part even though its not the perfect size. the air assist hose stuff won't work but no one cares about that usually, I don't recommend this I always say swap to an obd1 lower runner and use obd1 injectors..
other options were to try IS300 injectors but they aren't a perfect match either it turns out, lower o-ring is in a different spot. I would just change your lower runner to a odb1 lower runner and use the odb1 injectors, and yes the odb2 upper will bolt to the odb1 lower runner just fine. you can also use a obd1 throttle body and that will get rid of the other size of the air assist hose. If you have issues with your obd2 runner its fairly well documented now there is no good upgraded injectors that fit those, you need to downgrade to obd1 and use obd1 (regular) style injectors. I recommend using the vvti coils and ignitor setup, which is all around better than gte coils and fits under the stock intake manifold. 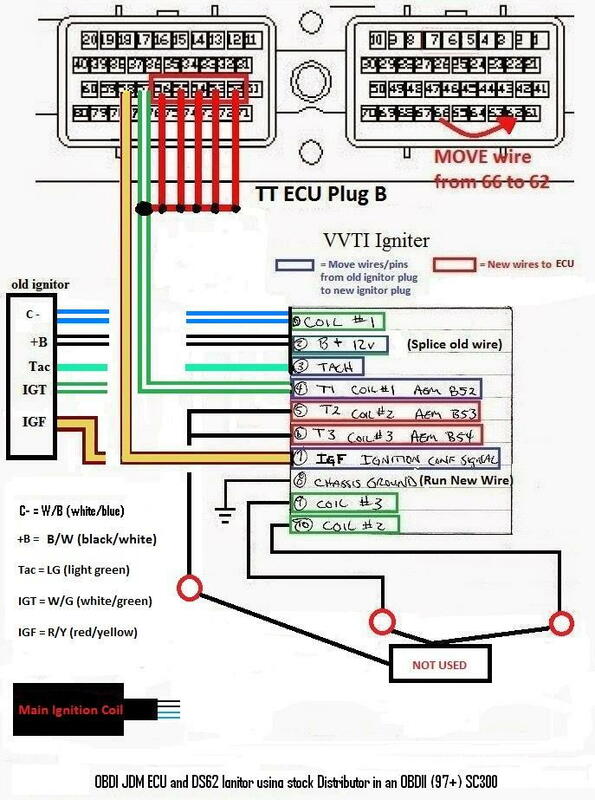 See the diagram for the vvti wiring below. You can run the vvti coils with either the lexus ignitor (DH61) or a toyota ignitor (DS62) as they both are the same ignitor. I recommend finding the DS62 because they are widely available online and you can usually get the plug with some wires on it all for around ~$30, and the plug is really usefull as plug alone cost similar at toyota, and the dh61 alone will be several times more than this price and I have never seen one with the plug cause no one in their right mind will cut a vvti harness so you can have the plug and wires. You can get these parts at Toyota also if you have one without the plug but its pricey for just a connector and some wires. I put steps 2 and 3 together, its because when doing the injectors you will have the stock intake manifold apart, and is a good time to drop the coils in as you will have to remove at least to the throttle body to get the vvti coils dropped in, like a regular spark plug change. Also the old metal spark plug holder thing needs to come out of the plug valley so your coilpacks can sit right and its held on by the inside valve cover bolts. Step 4: Fire her up and set your base timing with a timing light. 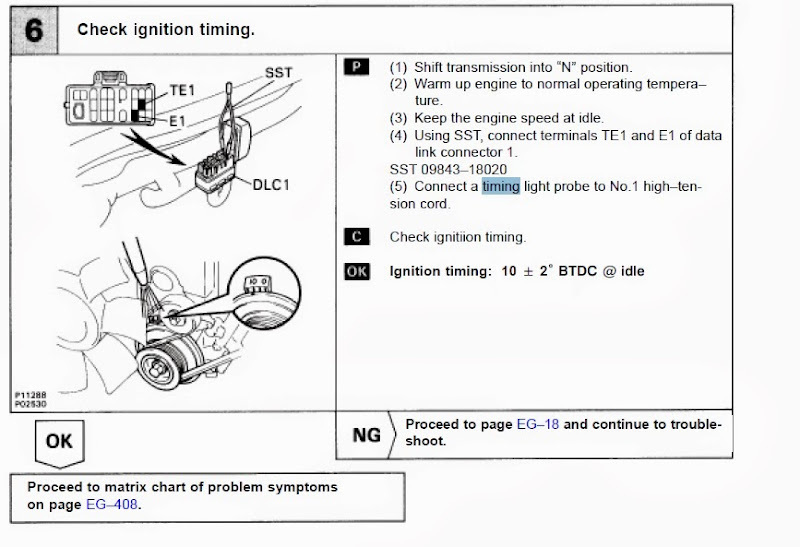 Follow the timing check procedure in any of the manuals. You jumper the diagnostic pins (TE1 and E1), and set the base timing by rotating the distributor. You should always hear a VERY NOTICEABLE change in how the motor is running/sounding when you put the jumper in to set the base timing. If you don't hear anything change, the tps is not in the right position and it wont let you change base timing cause it thinks you are revving some. See this very helpful post by HiPSI showing how to adjust the tps when ecu won't let you set base timing. Once you got it changing sound when you put in the jumper, you are ready to initially set the base timing. I recommend starting low like 6-8 degrees I like mine best @ 8 and I have a TT headgasket only. After it is warmed up fully hot double check and adjust your base timing if necessary. If you set it cold before then it may be different now. stock gte base timing is 10 degrees but the higher your compression is the less base timing you can run or you may pick up knock. For Example: If you have gte compression (8.5), set it to 10. if you have 9.x:1 compression, set it to 8. If you have stock compression, you probably want to try 6-8. Play with the advance at your own risk but remember lower is safer. The stock o2 sensor technically will work the JDM ecu and you only need one o2 sensor instead of 2 or 3 you may have already. some SC's come with 1 wires sensors (non heated) and 4 wire sensors (heated- found on obd2 or all cali spec). If you have a 4 wire then you have the right kind already, make sure the one that goes to ecu pin B48 is the one you are using, and that the heater for that one goes to B71. If your downpipe doesn't take the bolt on kind you have you can just get a 4 wire sensor described below that is a scew in type, and redo the wiring on your plug, no need to add wires to the ecu since your car came with heated you are ahead of the curve. If you have the 1 wire, then you can either use that and live with burning a little extra fuel on startup till the car warms, or get a 4 wire sensor and wire it up to the ecu. alot of times you want a new sensor because of a screw in type for most downpipes and well unless you just replaced yours its a good idea to get a new o2 sensor on these ecu's especially since you are turbo now. You can also just get a 1 wire screw in type and put it in and call it a day, but if you want your o2 to come on within 20 seconds or so of starting the car, then you need to add the heater wires. The sensor I use is a Denso 234-4309 universal 4 wire sensor (you can get great deals on these online usually under $35). One black wire goes to ecu pin B71 (heater pin ecu uses to turn heater on). Other black wire goes to 12v pin (black/red wire at ecu or in engine bay, power for the heater). The White wire to a chassis ground (Its a ground don't ask me what its for just ground it already). The blue wire goes to ecu pin B48 or just connect to original signal wire (the signal wire its pretty self explanatory). This is what it looks like on a car that comes with a 4 wire o2 stock for reference (95 supra TT USDM). Note that the heater wire on the JDM ecu is B71 as said above. It is not the one in the picture below the one below is just an example. 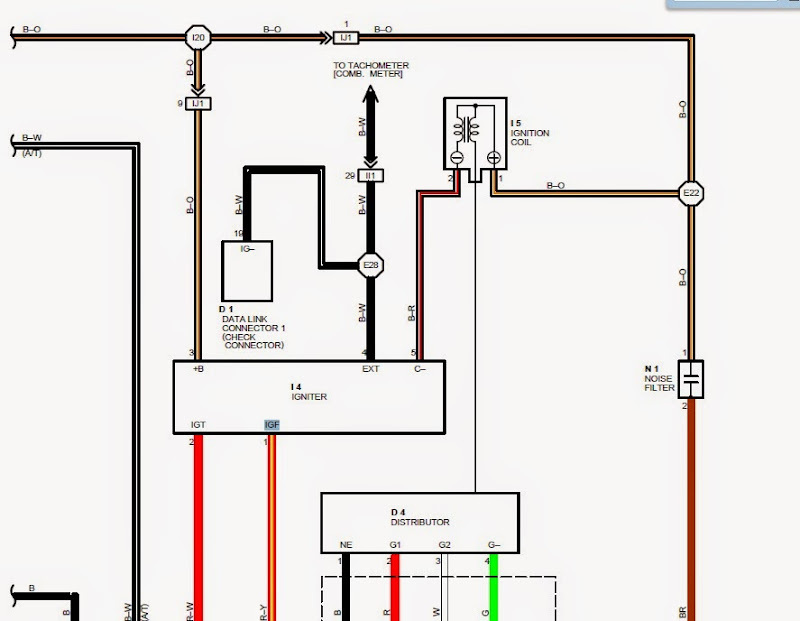 Step 6: A/C Relay (when using Aristo ecu, Supra ecu not needed). Basically GE Hvac unit sends send ground to the ecu, and aristo ecu wants a power signal, so this relay fixes that by sending power to the aristo ecu when it gets the ground from the GE Hvac unit. There was a theoretical relay fix here on post 1619 that was tried but it does not work, so don't expect this function to work. I would suggest swapping to a manual transmission and not worrying about any of this stuff as mainly the stock auto is delicate,. You can go with a GTE auto and add all the extra wiring (I dont know what exactly you will have to look up the wires or easier way is grab a gte harness and unwrap it and borrow all those wires). *Edit* I did some reading over at clubna-t in this thread http://forum.clubna-t.com/showthread.php?t=4145. Basically it says you can swap the valvebody of an GE auto onto a GTE auto so you can have a GTE auto controlled by the GE ecu (what we want but backwards). Well that got me thinking its probably possible to then install the GTE valvebody onto the GE transmission and control it with our GTE ecu. So if someone wants to try it just need a gte trans or valvebody, and then swap it onto your stock trans. the wiring would also need to be added for the extra solenoids like if you were swapping the whole gte auto and moving a pin or 2 around at the ecu. I would still think its better to swap in the gte auto and wire it up, than installing the valvebody on the GE transmission because the gte transmission can hold more power and more reliably. The TT ecu has different VSV's than the GE ecu and does not control ACIS correctly when doing the mod. This results in sluggish spool and down low performance basically getting no benefit from the GE intake manifold design. Good news is connecting the ACIS valve as shown in the post below will give you a large increase in spool compared to leaving it disconnected. In vacuum you get long runners all the time now for extra torque/spool, and when you get into boost it goes to short runner which is better for top end HP (when the engine needs the most air it can pull through both sides of the Y in short runner as opposed to one side in long runner). Think of it like a car having long runners all the time, and short runners in boost. the end result is very good for performance. If you have removed all those hardlines, simply run a vac line from intake manifold to the butterfly like you would connect a bov or boost gauge. Connecting the 2 hardpipes shown above achieves that by bypassing the canister and connecting the butterfly to the intake directly. the 3 channel (vvti) and 6 channel (gte) ignitors put out a different tach signal than the stock 1 channel ignitor (distributor). to get it working again remove the cluster and you need to jump a resistor with a short piece of wire (bypassing it). easiest is to just solder each side of the wire to each of the legs of the resistor going into the board (you don't have to remove resistor in case you ever want to go back just cut wire). its the same thing you would do if you were doing a gte swap. jump the R109 resistor on 92-94 clusters, and the R73 resistor on 95-96 clusters. cheap engine management for 400hp with the 440cc injectors, basically how a stock supra drives with a single on it. throw on a piggyback and larger injectors after you get it all sorted and you can make even more power. The best part with na-t is that the distributor can be rotated, so you can actually change your base timing with the gte ecu. If you run really large injectors and your piggyback is advancing your timing, you can actually dial back your base timing with the distributor/CPS. YOU CANT DO THAT ON A GTE MOTOR!!! an extra feature that may prove to be very helpful in the future. I have found it to run really well with the stock map sensor and 440cc injectors. thats a great baseline to start from. The TT coilopacks and ignitor works with the TT ecu, The vvti coilpacks and ignitor works as well, I have verified both. I have not run the distributor in its stock form with the stock ignitor and coil, and some people are having ignitor issues trying out the stock setup. The gte ecu with proper coils should now be the starting point for na-t management. the ge ecu cannot even compare to how the gte ecu drives. My car drives like a stock lexus again, with about double the power. Short vid of it running on the GTE coils and Ignitor, before i installed the vvti coils and ignitor. Note: if you do not have a front facing intake manifold (FFIM), you cannot run TT coils and ignitor, they wont fit under the stock intake. This is another reason I only recommend the vvti coils now. Another short vid of it running on the vvti coils and ignitor (my preferred/current setup). Here is what the ecu connector looks like and the places of interest to us (GE and GTE have same connector). This shows how you wire up the coils and also move the wire for the old maf sensor to the new MAP sensor spot (ODB1 only). your wire colors may be different but the pin locations are always the same on these ignitors. 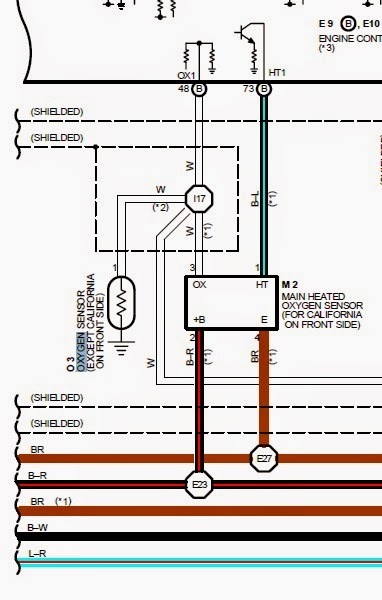 look at this diagram from a 95 supra for pin locations (I don't have the SC one right now). the power wire is usually black/orange, and the IGF is usually red/yellow... the tach wire is usually black or black white..
First remove all the pins/wires out from the old ignitor plug, and then insert them into the new ds62 ignitor plug as shown in the diagram, this includes +B, tach, IGT1, IGF. you only run 2 new wires from the ecu and that is IGT2 and IGT3. Then you add a ground wire and ground it to chassis ground or even battery ground. For the 4 wires to the coils, you run the 3 signal wires (coils 1-3) to the new coils, and for the +B for the coil you have to splice off the +B wire you just moved over from the old ignitor. The old coil wire that goes from the stock ignitor to the stock coil is not shown in the diagram above because normally its not used as it goes to the wrong place, but its the 5th wire connected to the old ignitor that's not the 4 shown above. If you were to rewire your harness you could potentially move and reuse this wire, but its easier to just forget about it, and get a mk3 coilpack harness and extend those 4 wires from the coils to the ignitor, as it already has the right clips on it and everything, its just short some. this is the wire description for the maf plug on the diagram below. Nice, good to see people giving it a shot. not sure if the gte ignitor can run wastespark coils but test it out. These days I actually prefer the stock distributor over the CPS, but there is no short cap available for it yet, you have to make one yourself for the time being. The stock ignitor is not compatible with the gte ecu. the difference is the older ignitors returned an old style IGF signal to the ecu which it needs to stay running, and the newer coilpacks ecu's they changed the IGF to a current type signal so the engine starts and then dies. What you do is replace the stock ignitor with the DS62 ignitor, and do not add the 2 new wires coming from the ecu. You just pin up the old wires into the right spots on the new connector all for coil 1, so coil 2-3 and IGT 2-3 will be blank/unused on the new ignitor. Basically we are only using 1 channel of the 3 channels on the new ignitor, and it should work fine and return the right IGF to the ecu. this shows the colors on a 97 harness which may look different than your or above. Here is how you wire that up for the USDM ecu on a 96-97 2JZGE harness. wire up the coilpacks and ignitor as shown for the JDM ecu mod above. it is the same. The stock maf sensor will be swapped with a TT unit, and the maf sensor plug will not be modified at all since 96-97 uses a hotwire 12V maf and the GTE maf is a 12v Hotwire maf with the exact same plug, do not cut the maf connector off like the JDM mod version above since its already plug and play. Since the USDM ecu uses both a maf and a map, we will run new wires for the map sensor since the maf is being kept. (Note for 96 harness users: on a 97 GE harness the maf ground wire 28 and is the same as a GTE pin, but it may be pin 30 on the 96 GE harness, so if you have a 96 you may have to move pin 30 to 28 for the maf to work correctly). Just an update, for those using the US maf with a single turbo, it doesn't run that well until you delete the maf by using either a VPC or a map ecu type unit. its well documented on supraforums. you can try the maf but I wont be helping troublshoot stuff that doesn't work right, plan to convert to map on the USDM ecu. its worth it if you have to keep obd2, otherwise just use a JDM ecu. ultimately it should be a 2jz map sensor wired in for the US map sensor, and for the US maf sensor you have a map ecu or vpc wired to that. so technically you have 2 map sensors, but the only one that is used for fueling on a US ecu is the one which was converted from being a maf. For the Map sensor you run a new signal wire from the ecu from B62 to the map sensor signal on the connector and for the power and ground for the MAP sensor you can tap into the TPS power and special sensor ground, the TPS and MAP sensor power wires are the same blue/red color wire on all the harnesses this is the ecu 5V wire. Do not try to tap the power off the maf wires for the Map sensor as the maf is 12v and will not work on the map sensor, could even mess it up. Do not try and use the ground of the maf as this is a 12v or standard ground the map sensor uses the special sensor ground, again tps sensor is easiest place to pick up the power and ground for these then you only need to run 1 wire to the engine bay to the map sensor. This is my recommended method. Refer to Aaron's 97 build thread that shows a new diagram for wiring the map sensor to the IAT for 96+ models. Do note he used a JDM ecu but his diagram still shows the wiring for the map sensor power and ground that is needed on 96+ harnesses. If you are on US ecu, the map signal will likely be running a new wire for the map signal, not reusing 62 from the maf as the US still needs that wire. Thanks again for the updated diagram!! There is no separate IAT (air intake sensor) like the jdm ecu has, because on the US setup it is built into the maf (see wire for THA) it is already wired so you can skip over IAT related stuff. 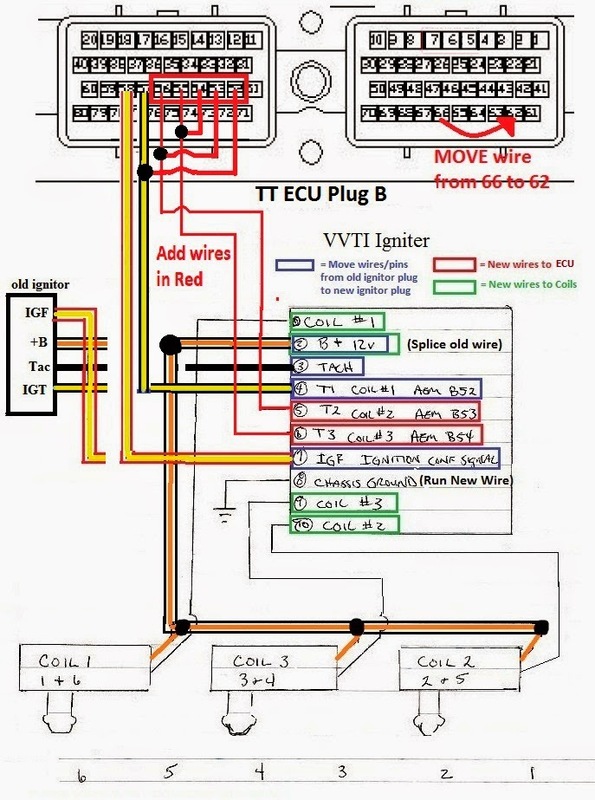 I would use the vvti coil setup above, but if you need to use sequential coils or just the regular gte coils, here is the stock wiring for the TT coilpacks. Again note: THEY DO NOT FIT UNDER THE STOCK GE INTAKE. YOU MUST HAVE A FFIM. This time you will need to run 5 new wires instead of just the 2 needed for vvti coils, and just like above you reuse 57 and 58 (IGT1 and IGF) from the old ignitor as they are already there stock so you are just adding 52-56 and running to TT ignitor. You wire them like the gte coils above, except the wires from the ecu go straight to the coils skipping the ignitor. Each coil will one also get its own power wire and ground wire since they have internal ignitors. Each coil returns its own IGF signal, so you must connect all 6 wires together and feed them back to the 1 stock IGF wire to keep the engine happy and running. The GM coils do not return an IGF signal to the ecu, so to keep the engine running you will need an IGF Simulator/faker or find some way to keep the factory ignitor in the mix. If you know of another method that works let me know. Thanks man, I REALLY appreciate it!!!! sticky? or add to sc3 perf section? Aren't there more things you have to have in order to use this ECU? like 440cc injectors? Heated o2 sensors and maybe a few others just for cel's. I'm really not sure why I didn't realize that's what you were saying. I was thinking it was telling you how the ECU's came.....lol just misunderstood my bad! We have regular 1 wire (non heated) o2 sensors (unless you have a lucky cali spec). TT ecu's use heated o2 sensors which have 2-4 wires depending on the year/where it was produced. so its easiest to just order o2 sensors for the specific car your ecu came from. some people like to just use the regular o2 sensors and just wire in resistors to "simulate" the heater circuit so the ecu doesn't throw any codes. its simple and it works, but you have 2 really hot resistors you have to deal with mounting now. I feel its easiest to get new sensors and run the 2 extra wires for them to the ecu (straight shot through firewall), its easy to do and you get new sensors, which is all around better than reusing a tired old sensor on a performance car. Im bumping this up cause I just ordered my GTE ecu, I will keep everyone posted on the progress once I get the ecu in, and start the conversion. Just need to find the IAT sensor. What resistor is needed to simulate the heater circuit? And what pin #'s do the IAT and MAP sensor wire to? The last pictures is kinda small and I cant see it.. I'm uploading a zoomed in pic of the original. I just cut my old maf connector off and made a new connector using those wires for my map and Iat sensor. If you do it this way then there is no need to run new map+Iat wires to the ecu at all.